Internet Explorer and Security settings. After installing a server in my test environment, I immediately wanted to install the Windows Admin Center application. Lo and behold! I received an error message. “Your current security settings do not allow this file to be downloaded”. Great, so now we can copy the file from another server, or we lower the Internet security settings in Internet Explorer. 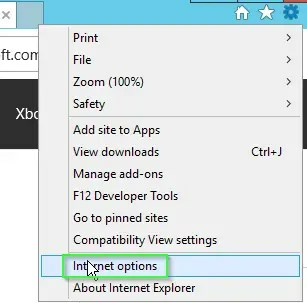 I will explain to you in the tutorial how you can reduce the Internet Explorer security settings, but keep in mind that these are settings that you can keep for example on a server. You do not use a server to browse the internet and I also advise you to download applications on your Windows device and then copy them to your server for security reasons instead of changing the security settings in Internet Explorer. Let’s Fix “Your current security settings do not allow this file to be downloaded”. The tutorial consists of screenshots. For the system administrators among us, I’ve also made a short step-by-step list. For end users I recommend using the tutorial with screenshots. Part one: Quick list of step-by-step. Click on the gear and open Internet Options. Click on the tab Security make sure you’ve selected Internet. 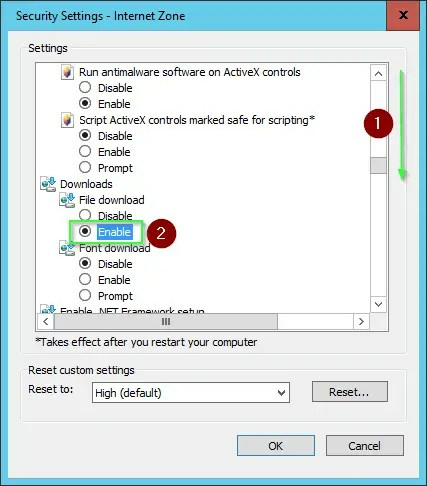 Scroll to downloads and check Enable at File Download. Click on the Gearwheel in the upper-right corner of Internet Explorer. Click on the second tab: Security. Make sure you’ve selected Internet in ‘Select a zone to view or change security settings’. Now go to Custom Level in ‘Security level for this zone’. Scroll down a bit and search for Downloads. In Downloads you have another tab File download select Enable here. It should now be possible to download something. As I have indicated above, I do not recommend this for Windows Servers. If you need an application you can download it on your own Windows Device and then copy it to the server. I reviewed this blog post on 7-5-2018 and the content is still relevant. I have adjusted the content so much that I have decided to re-publish the post. Do you have further questions, or do you not succeed with the tutorial? Then please you can leave a comment.